Home | Quilt Index | Thirteen Quilts–Lucky Us! 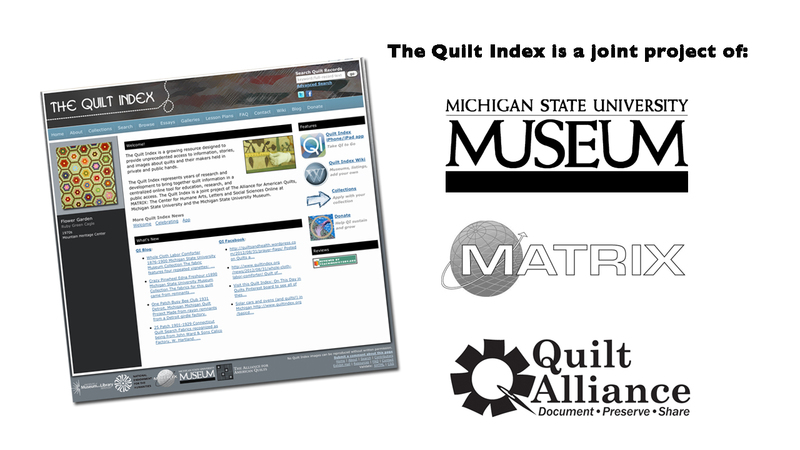 The Henry Ford Museum in Dearborn, Michigan is one of forty museums who have contributed quilt records to The Quilt Index as part of the Michigan Quilt Project (see a complete list here with links to quilts in each collection). McCord, like other thrifty housewives of the era, sewed her quilts from fabric she had on hand, mostly clothing scraps. Her everyday life was filled with household and farm chores; her “scraps” of leisure time were filled with masterful quilt making. Susan and her husband Green McCord farmed an eighty-acre farm in McCordsville, Indiana. Here Susan McCord kept house, brought up her children, sewed clothing for her family, knitted accessories, practiced homeopathic medicine, read her bible through each year, participated in sewing bees, gardened, took care of the cows and chickens–and found time to make at least thirteen extraordinary bed quilts. McCord used traditional materials, techniques and patterns—but her considerable skill at manipulating fabric, color and design turned the traditional into something exceptional. McCord’s bed coverings stand as the extraordinary legacy of an otherwise little-known Indiana farmwife.